Who is the Bulls’ All-Star? The Bulls should be represented at the NBA All-Star Game on Feb. 17 in Houston. The question is by whom. My guess is it will be Joakim Noah, but it won’t be determined until next week when the Eastern Conference coaches select the All-Star reserves. The NBA Thursday on TNT announced the starters for the 62nd annual event. The Eastern Conference starters will be Dwyane Wade and Rajon Rondo in the backcourt and LeBron James, Carmelo Anthony and Kevin Garnett in the front court. The NBA changed the designations this year to front and backcourt instead of guard, forward and center. The Western Conference starters are No. 1 overall vote-getter Kobe Bryant, Chris Paul, Kevin Durant, Dwight Howard despite his limited play this season and Blake Griffin. Noah finished highest among Bulls players in the voting for starters, seventh among frontcourt players after James, Anthony, Garnett, Chris Bosh, Tyson Chandler and Paul Pierce. Deng finished 12th. There is no guarantee, of course, a Bulls player will be selected, especially with Derrick Rose basically ineligible because he hasn’t played this season while recuperating from knee surgery. Rose has been an All-Star the last three years, including voted a starter the last two seasons. Luol Deng joined Rose last season as a reserve. But the coaches generally favor players from winning teams, which makes it a likelihood a Bulls player will be added to the team. It’s how the Pacers’ Roy Hibbert, who hardly has an All-Star profile, was added to last year’s team. One potential complication is the Bulls have three players for whom you could make a case to be an All Star. It’s possible they could split coaches’ votes and knock one another off. — Noah. The 27-year-old sixth season veteran is having a career year. He’s by far playing his most ever, tied for fifth in the league in minutes played at 38.4 per game. Noah is averaging a career high 12.4 points per game and 10.7 rebounds, one of 11 players in the NAB averaging a double-double. Noah is eighth overall in the NBA in rebounding and he’s tied for 10th in the NBA in double/doubles with 18 and is averaging 4.1 assists, a career high and best among all NBA centers. — Deng: He’s become the ironman of the NBA, the only player in the league averaging more than 40 minutes per game. 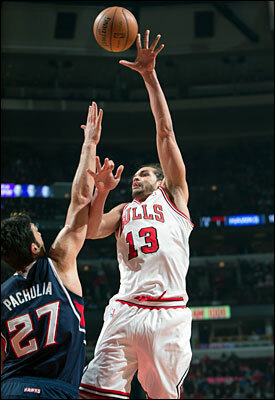 Plus, with Rose out Deng has been a finisher for the Bulls, hitting the game winner for the Bulls Wednesday in Toronto. He’s the team’s best defender and regularly guards the opposition’s best scorer. He is averaging 17.8 points, second highest in his career, 6.5 rebounds and a career high three assists per game. His scoring average is tied for 19th in the NBA. — Boozer: He’s enjoying something of a renaissance season, though in just 30.7 minutes per game. He is averaging 16.1 points and 9.7 rebounds, 12th overall in the NBA, and leads the Eastern Conference in double-doubles with 21. Boozer also is averaging 2.1 assists and shooting 49 percent. Another potential complication is there was no center selected among the starters in the Eastern Conference. That makes it likely the coaches will add the Knicks’ Chandler, who is the reigning Defensive Player of the Year with the Knicks ranking second in the conference behind Miami. The Heat’s Bosh, who basically plays center for the Heat, also is expected to be added. And there’s the Nets’ Brook Lopez, the 15th leading scorer in the league at 18.6 per game. An example, however, of that potential of one Bulls player knocking another off was on the TNT show announcing the starters. The panelists of Charles Barkley, Kenny Smith and Shaquille O’Neil along with Chris Webber made their choices for the seven reserves in each conference. Three of the four added Noah among their seven. But Barkley had Boozer instead of Noah on his list. It would seem most likely from among their picks, although that group doesn’t have a particularly good track record for accuracy, the consensus East favorites to be added are Bosh, Paul George, Chandler and Lopez. All mentioned J.R. Smith, which seems ludicrous the coaches would add a third Knicks player who not only comes off the bench but has a history of mocking his coaches. It’s where you find former player on TV who are generally out of touch with the workings of the league as they mostly are concerned with what fellow players say. Also mentioned on a few of their lists was Paul Pierce, Deron Williams, Kyrie Irving and Brandon Jennings. Though it’s rare for players from big losing teams to be included. So if the coaches remain true to their oft-stated code that winning is what matters most, the Bulls should be sending someone to Houston.